A Bulgarian think-tank raised an alert on Monday over the high concentration of dust particles in the air, which they say affects half of the country's population. Experts from the Center for the Study of Democracy have attributed the abnormally high pollution levels in Bulgaria to domestic heating, thermal power plants, fog, road traffic and industrial emissions. The experts pointed out that air dust affects the lungs and heart and is one of the main factors to blame for the sharp rise in allergy incidence. They called for urgent measures to be taken by the different sectors of Bulgaria's economy. The first days of 2012 exceeded the norm in levels of harmful particles in the regions of Blagoevgrad, Varna, Vidin, Gorna Oryahovitsa, Dobrich, Kardzhali, Nessebar, Pernik, Pleven, Plovdiv, Ruse, Smolyan, Sofia and Shumen, according to data by the executive environmental agency. Readings at specific points in the town of Shumen exceeding the norm nearly four times, the agency said. EU standard values for fine dust say a maximum of 50 microgram per cubic meter may be exceeded on up to 35 days per year. 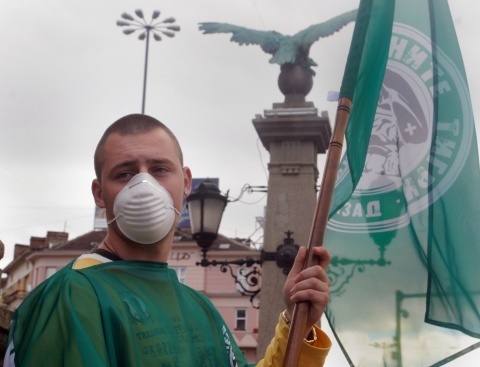 Residents of many Bulgarian cities have even started wearing altered surgical masks to protect themselves from the poisonous dust.